Piezoelectricity is exploited in a number of useful applications, such as the production and detection of sound, piezoelectric inkjet printing, generation of high voltages, electronic frequency generation, microbalances, to drive an ultrasonic nozzle, and ultrafine focusing of optical assemblies. It forms the basis for a number of scientific instrumental techniques with atomic resolution, the scanning probe microscopies, such as STM, AFM, MTA, and SNOM. It also finds everyday uses such as acting as the ignition source for cigarette lighters, push-start propane barbecues, used as the time reference source in quartz watches, and in amplification pickups for some guitars. The pyroelectric effect, by which a material generates an electric potential in response to a temperature change, was studied by Carl Linnaeus and Franz Aepinus in the mid-18th century. Drawing on this knowledge, both René Just Haüy and Antoine César Becquerel posited a relationship between mechanical stress and electric charge; however, experiments by both proved inconclusive. For the next few decades, piezoelectricity remained something of a laboratory curiosity. More work was done to explore and define the crystal structures that exhibited piezoelectricity. This culminated in 1910 with the publication of Woldemar Voigt's Lehrbuch der Kristallphysik (Textbook on Crystal Physics), which described the 20 natural crystal classes capable of piezoelectricity, and rigorously defined the piezoelectric constants using tensor analysis. The first practical application for piezoelectric devices was sonar, first developed during World War I. In France in 1917, Paul Langevin and his coworkers developed an ultrasonic submarine detector. The detector consisted of a transducer, made of thin quartz crystals carefully glued between two steel plates, and a hydrophone to detect the returned echo. By emitting a high-frequency pulse from the transducer, and measuring the amount of time it takes to hear an echo from the sound waves bouncing off an object, one can calculate the distance to that object. During World War II, independent research groups in the United States, Russia, and Japan discovered a new class of synthetic materials, called ferroelectrics, which exhibited piezoelectric constants many times higher than natural materials. This led to intense research to develop barium titanate and later lead zirconate titanate materials with specific properties for particular applications. Development of piezoelectric devices and materials in the United States was kept within the companies doing the development, mostly due to the wartime beginnings of the field, and in the interests of securing profitable patents. New materials were the first to be developed — quartz crystals were the first commercially exploited piezoelectric material, but scientists searched for higher-performance materials. Despite the advances in materials and the maturation of manufacturing processes, the United States market did not grow as quickly as Japan's did. Without many new applications, the growth of the United States' piezoelectric industry suffered. In contrast, Japanese manufacturers shared their information, quickly overcoming technical and manufacturing challenges and creating new markets. In Japan, a temperature stable crystal cut was developed by Issac Koga. Japanese efforts in materials research created piezoceramic materials competitive to the United States materials but free of expensive patent restrictions. Major Japanese piezoelectric developments included new designs of piezoceramic filters for radios and televisions, piezo buzzers and audio transducers that can connect directly to electronic circuits, and the piezoelectric igniter, which generates sparks for small engine ignition systems and gas-grill lighters, by compressing a ceramic disc. Ultrasonic transducers that transmit sound waves through air had existed for quite some time but first saw major commercial use in early television remote controls. These transducers now are mounted on several car models as an echolocation device, helping the driver determine the distance from the car to any objects that may be in its path. The nature of the piezoelectric effect is closely related to the occurrence of electric dipole moments in solids. The latter may either be induced for ions on crystal lattice sites with asymmetric charge surroundings (as in BaTiO3 and PZTs) or may directly be carried by molecular groups (as in cane sugar). The dipole density or polarization (dimensionality [C·m/m3] ) may easily be calculated for crystals by summing up the dipole moments per volume of the crystallographic unit cell. As every dipole is a vector, the dipole density P is a vector field. Dipoles near each other tend to be aligned in regions called Weiss domains. The domains are usually randomly oriented, but can be aligned using the process of poling (not the same as magnetic poling), a process by which a strong electric field is applied across the material, usually at elevated temperatures. Not all piezoelectric materials can be poled. Of decisive importance for the piezoelectric effect is the change of polarization P when applying a mechanical stress. This might either be caused by a reconfiguration of the dipole-inducing surrounding or by re-orientation of molecular dipole moments under the influence of the external stress. Piezoelectricity may then manifest in a variation of the polarization strength, its direction or both, with the details depending on: 1. the orientation of P within the crystal; 2. crystal symmetry; and 3. the applied mechanical stress. The change in P appears as a variation of surface charge density upon the crystal faces, i.e. as a variation of the electric field extending between the faces caused by a change in dipole density in the bulk. For example, a 1 cm3 cube of quartz with 2 kN (500 lbf) of correctly applied force can produce a voltage of 12500 V.
Piezoelectric materials also show the opposite effect, called the converse piezoelectric effect, where the application of an electrical field creates mechanical deformation in the crystal. where [d] is the matrix for the direct piezoelectric effect and [dt] is the matrix for the converse piezoelectric effect. The superscript E indicates a zero, or constant, electric field; the superscript T indicates a zero, or constant, stress field; and the superscript t stands for transposition of a matrix. maps vectors into symmetric matrices. There are no non-trivial rotation-invariant tensors that have this property, which is why there are no isotropic piezoelectric materials. where the first equation represents the relationship for the converse piezoelectric effect and the latter for the direct piezoelectric effect. 12). Engineering shear strains are double the value of the corresponding tensor shear, such as S6 = 2S12 and so on. This also means that s66 = 1/G12, where G12 is the shear modulus. where the first set of four terms corresponds to the direct piezoelectric effect and the second set of four terms corresponds to the converse piezoelectric effect, and the reason why the direct piezoelectric tensor is equal to the transpose of the converse piezoelectric tensor originated from the Maxwell Relations in Thermodynamics. For those piezoelectric crystals for which the polarization is of the crystal-field induced type, a formalism has been worked out that allows for the calculation of piezoelectrical coefficients dij from electrostatic lattice constants or higher-order Madelung constants. Any spatially separated charge will result in an electric field, and therefore an electric potential. Shown here is a standard dielectric in a capacitor. In a piezoelectric device, mechanical stress, instead of an externally applied voltage, causes the charge separation in the individual atoms of the material. Of the 32 crystal classes, 21 are non-centrosymmetric (not having a centre of symmetry), and of these, 20 exhibit direct piezoelectricity (the 21st is the cubic class 432). Ten of these represent the polar crystal classes, which show a spontaneous polarization without mechanical stress due to a non-vanishing electric dipole moment associated with their unit cell, and which exhibit pyroelectricity. 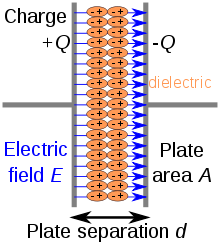 If the dipole moment can be reversed by applying an external electric field, the material is said to be ferroelectric. Polar crystal classes: 1, 2, m, mm2, 4, 4mm, 3, 3m, 6, 6mm. Piezoelectric crystal classes: 1, 2, m, 222, mm2, 4, 4, 422, 4mm, 42m, 3, 32, 3m, 6, 6, 622, 6mm, 62m, 23, 43m. For polar crystals, for which P ≠ 0 holds without applying a mechanical load, the piezoelectric effect manifests itself by changing the magnitude or the direction of P or both. For the nonpolar but piezoelectric crystals, on the other hand, a polarization P different from zero is only elicited by applying a mechanical load. For them the stress can be imagined to transform the material from a nonpolar crystal class (P = 0) to a polar one, having P ≠ 0. Lead titanate (PbTiO3). Although it occurs in nature as mineral macedonite, it is synthesized for research and applications. The action of piezoelectricity in Topaz can probably be attributed to ordering of the (F,OH) in its lattice, which is otherwise centrosymmetric: orthorhombic bipyramidal (mmm). Topaz has anomalous optical properties which are attributed to such ordering. Dry bone exhibits some piezoelectric properties. Studies of Fukada et al. showed that these are not due to the apatite crystals, which are centrosymmetric, thus non-piezoelectric, but due to collagen. Collagen exhibits the polar uniaxial orientation of molecular dipoles in its structure and can be considered as bioelectret, a sort of dielectric material exhibiting quasipermanent space charge and dipolar charge. Potentials are thought to occur when a number of collagen molecules are stressed in the same way displacing significant numbers of the charge carriers from the inside to the surface of the specimen. Piezoelectricity of single individual collagen fibrils was measured using piezoresponse force microscopy, and it was shown that collagen fibrils behave predominantly as shear piezoelectric materials. The piezoelectric effect is generally thought to act as a biological force sensor. This effect was exploited by research conducted at the University of Pennsylvania in the late 1970s and early 1980s, which established that sustained application of electrical potential could stimulate both resorption and growth (depending on the polarity) of bone in-vivo. Further studies in the 1990s provided the mathematical equation to confirm long bone wave propagation as to that of hexagonal (Class 6) crystals. Viral proteins, including those from bacteriophage. One study has found that thin films of M13 bacteriophage can be used to construct a piezoelectric generator sufficient to operate a liquid crystal display. Lead zirconate titanate (Pb[ZrxTi1−x]O3 with 0 ≤ x ≤ 1)—more commonly known as PZT, lead zirconate titanate is the most common piezoelectric ceramic in use today. Zinc oxide (ZnO)–Wurtzite structure. While single crystals of ZnO are piezoelectric and pyroelectric, polycrystalline (ceramic) ZnO with randomly oriented grains exhibits neither piezoelectric nor pyroelectric effect. Not being ferroelectric, polycrystalline ZnO cannot be poled like barium titanate or PZT. Ceramics and polycrystalline thin films of ZnO may exhibit macroscopic piezoelectricity and pyroelectricity only if they are textured (grains are preferentially oriented), such that the piezoelectric and pyroelectric responses of all individual grains do not cancel. This is readily accomplished in polycrystalline thin films. More recently, there is growing concern regarding the toxicity in lead-containing devices driven by the result of restriction of hazardous substances directive regulations. To address this concern, there has been a resurgence in the compositional development of lead-free piezoelectric materials. Sodium potassium niobate ((K,Na)NbO3). This material is also known as NKN or KNN. In 2004, a group of Japanese researchers led by Yasuyoshi Saito discovered a sodium potassium niobate composition with properties close to those of PZT, including a high TC. Certain compositions of this material have been shown to retain a high mechanical quality factor (Qm ≈ 900) with increasing vibration levels, whereas the mechanical quality factor of hard PZT degrades in such conditions. This fact makes NKN a promising replacement for high power resonance applications, such as piezoelectric transformers. Bismuth ferrite (BiFeO3) is also a promising candidate for the replacement of lead-based ceramics. So far, neither the environmental effect nor the stability of supplying these substances have been measured. A piezoelectric potential can be created in any bulk or nanostructured semiconductor crystal having non central symmetry, such as the Group III–V and II–VI materials, due to polarization of ions under applied stress and strain. This property is common to both the zincblende and wurtzite crystal structures. To first order, there is only one independent piezoelectric coefficient in zincblende, called e14, coupled to shear components of the strain. In wurtzite, there are instead three independent piezoelectric coefficients: e31, e33 and e15. The semiconductors where the strongest piezoelectricity is observed are those commonly found in the wurtzite structure, i.e. GaN, InN, AlN and ZnO. ZnO is the most used material in the recent field of piezotronics. Since 2006, there have also been a number of reports of strong non linear piezoelectric effects in polar semiconductors. Such effects are generally recognized to be at least important if not of the same order of magnitude as the first order approximation. The piezo-response of polymers is not as high as the response for ceramics; however, polymers hold properties that ceramics don't. Over the last few decades, non-toxic, piezoelectric polymers have been studied and applied due to their flexibility and smaller acoustical impedance. Other properties that make these materials significant include their biocompatibility, biodegradability, low cost, and low power consumption compared to other piezo-materials (ceramics, etc.). Piezoelectric polymers and non-toxic polymer composites can be used given their different physical properties. Piezoelectric polymers can be classified by bulk polymers, voided charged polymers, and polymer composites. A piezo-response observed by bulk polymers is mostly due to its molecular structure. There are two types of bulk polymers: amorphous and semi-crystalline. Examples of semi-crystalline polymers are Polyvinylidene Fluoride (PVDF) and its copolymers, Polyamides, and Paralyne-C. Non-crystalline polymers, such as Polyimide and Polyvinylidene Chloride (PVDC), fall under amorphous bulk polymers. Voided charged polymers exhibit the piezoelectric effect due to charge induced by poling of a porous polymeric film. Under an electric field, charges form on the surface of the voids forming dipoles. Electric responses can be caused by any deformation of these voids. The piezoelectric effect can also be observed in polymer composites by integrating piezoelectric ceramic particles into a polymer film. A polymer doesn’t have to be piezo-active to be an effective material for a polymer composite. In this case, a material could be made up of an inert matrix with a separate piezo-active component. PVDF exhibits piezoelectricity several times greater than quartz. The piezo-response observed from PVDF is about 20-30 pC/N. That is an order of 5-50 times less than that of piezoelectric ceramic lead zirconate titanate (PZT). The thermal stability of the piezoelectric effect of polymers in the PVDF family (ie. vinylidene fluoride co-poly trifluoroethylene) goes up to 125°C. Some applications of PVDF are pressure sensors, hydrophones, and shock wave sensors. Due to their flexibility, piezoelectric composites have been proposed as energy harvesters and nanogenerators. In 2018, it was reported by Zhu et al. that a piezoelectric response of about 17 pC/N could be obtained from PDMS/PZT nanocomposite at 60% porosity. Another PDMS nanocomposite was reported in 2017, in which BaTiO3 was integrated into PDMS to make a stretchable, transparent nanogenerator for self-powered physiological monitoring. In 2016, polar molecules were introduced into a polyurethane foam in which high responses of up to 244 pC/N were reported. In 2000, it was shown that an actuator can be made of paper. The wood fibers, called cellulose fibers, are aligned so that there is a dipolar orientation. This allows the material to become piezoelectric. To enhance the effect, the material can be poled for further alignment. D33 responses for cellular polypropylene are around 200 pC/N. Some applications of cellular polypropylene are musical key pads, microphones, and ultrasound-based echolocation systems. A strong shear piezoelectric activity was observed in self-assembled diphenylalanine peptide nanotubes (PNTs), indicating electric polarization directed along the tube axis. Comparison with LiNbO3 and lateral signal calibration yields sufficiently high effective piezoelectric coefficient values of at least 60 pm/V (shear response for tubes of ≈200 nm in diameter). PNTs demonstrate linear deformation without irreversible degradation in a broad range of driving voltages. Currently, industrial and manufacturing is the largest application market for piezoelectric devices, followed by the automotive industry. Strong demand also comes from medical instruments as well as information and telecommunications. The global demand for piezoelectric devices was valued at approximately US$14.8 billion in 2010. The largest material group for piezoelectric devices is piezoceramics, and piezopolymer is experiencing the fastest growth due to its low weight and small size. Direct piezoelectricity of some substances, like quartz, can generate potential differences of thousands of volts. A similar idea is being researched by DARPA in the United States in a project called Energy Harvesting, which includes an attempt to power battlefield equipment by piezoelectric generators embedded in soldiers' boots. However, these energy harvesting sources by association affect the body. DARPA's effort to harness 1–2 watts from continuous shoe impact while walking were abandoned due to the impracticality and the discomfort from the additional energy expended by a person wearing the shoes. Other energy harvesting ideas include harvesting the energy from human movements in train stations or other public places and converting a dance floor to generate electricity. Vibrations from industrial machinery can also be harvested by piezoelectric materials to charge batteries for backup supplies or to power low-power microprocessors and wireless radios. A piezoelectric transformer is a type of AC voltage multiplier. Unlike a conventional transformer, which uses magnetic coupling between input and output, the piezoelectric transformer uses acoustic coupling. An input voltage is applied across a short length of a bar of piezoceramic material such as PZT, creating an alternating stress in the bar by the inverse piezoelectric effect and causing the whole bar to vibrate. The vibration frequency is chosen to be the resonant frequency of the block, typically in the 100 kilohertz to 1 megahertz range. A higher output voltage is then generated across another section of the bar by the piezoelectric effect. Step-up ratios of more than 1,000:1 have been demonstrated. An extra feature of this transformer is that, by operating it above its resonant frequency, it can be made to appear as an inductive load, which is useful in circuits that require a controlled soft start. These devices can be used in DC–AC inverters to drive cold cathode fluorescent lamps. Piezo transformers are some of the most compact high voltage sources. Many rocket-propelled grenades used a piezoelectric fuse. For example: RPG-7. Piezoelectric materials are used in single-axis and dual-axis tilt sensing. A piezoelectric transducer was used in the penetrometer instrument on the Huygens Probe. Piezoelectric transducers are used in electronic drum pads to detect the impact of the drummer's sticks, and to detect muscle movements in medical acceleromyography. Automotive engine management systems use piezoelectric transducers to detect Engine knock (Knock Sensor, KS), also known as detonation, at certain hertz frequencies. A piezoelectric transducer is also used in fuel injection systems to measure manifold absolute pressure (MAP sensor) to determine engine load, and ultimately the fuel injectors milliseconds of on time. As very high electric fields correspond to only tiny changes in the width of the crystal, this width can be changed with better-than-µm precision, making piezo crystals the most important tool for positioning objects with extreme accuracy — thus their use in actuators. Multilayer ceramics, using layers thinner than 100 µm, allow reaching high electric fields with voltage lower than 150 V. These ceramics are used within two kinds of actuators: direct piezo actuators and Amplified piezoelectric actuators. While direct actuator's stroke is generally lower than 100 µm, amplified piezo actuators can reach millimeter strokes. Loudspeakers: Voltage is converted to mechanical movement of a metallic diaphragm. A related application is the acousto-optic modulator, a device that scatters light off soundwaves in a crystal, generated by piezoelectric elements. This is useful for fine-tuning a laser's frequency. Atomic force microscopes and scanning tunneling microscopes employ converse piezoelectricity to keep the sensing needle close to the specimen. Active vibration control using amplified actuators. High-intensity focused ultrasound for localized heating or creating a localized cavitation can be achieved, for example, in patient's body or in an industrial chemical process. Refreshable braille display A small crystal is expanded, by applying a current, that moves a lever to raise individual braille cells. The piezoelectrical properties of quartz are useful as a standard of frequency. Quartz clocks employ a crystal oscillator made from a quartz crystal that uses a combination of both direct and converse piezoelectricity to generate a regularly timed series of electrical pulses that is used to mark time. The quartz crystal (like any elastic material) has a precisely defined natural frequency (caused by its shape and size) at which it prefers to oscillate, and this is used to stabilize the frequency of a periodic voltage applied to the crystal. The same principle is used in some radio transmitters and receivers, and in computers where it creates a clock pulse. Both of these usually use a frequency multiplier to reach gigahertz ranges. Rectangular four-quadrant motors with high power density (2.5 W/cm3) and speed ranging from 10 nm/s to 800 mm/s. Stepping piezo motor, using stick-slip effect. Aside from the stepping stick-slip motor, all these motors work on the same principle. Driven by dual orthogonal vibration modes with a phase difference of 90°, the contact point between two surfaces vibrates in an elliptical path, producing a frictional force between the surfaces. Usually, one surface is fixed, causing the other to move. In most piezoelectric motors, the piezoelectric crystal is excited by a sine wave signal at the resonant frequency of the motor. Using the resonance effect, a much lower voltage can be used to produce a high vibration amplitude. A stick-slip motor works using the inertia of a mass and the friction of a clamp. Such motors can be very small. Some are used for camera sensor displacement, thus allowing an anti-shake function. Different teams of researchers have been investigating ways to reduce vibrations in materials by attaching piezo elements to the material. When the material is bent by a vibration in one direction, the vibration-reduction system responds to the bend and sends electric power to the piezo element to bend in the other direction. Future applications of this technology are expected in cars and houses to reduce noise. Further applications to flexible structures, such as shells and plates, have also been studied for nearly three decades. In a demonstration at the Material Vision Fair in Frankfurt in November 2005, a team from TU Darmstadt in Germany showed several panels that were hit with a rubber mallet, and the panel with the piezo element immediately stopped swinging. Piezoelectric ceramic fiber technology is being used as an electronic damping system on some HEAD tennis rackets. In people with previous total fertilization failure, piezoelectric activation of oocytes together with intracytoplasmic sperm injection (ICSI) seems to improve fertilization outcomes. A recent application of piezoelectric ultrasound sources is piezoelectric surgery, also known as piezosurgery. Piezosurgery is a minimally invasive technique that aims to cut a target tissue with little damage to neighboring tissues. For example, Hoigne et al. reported its use in hand surgery for the cutting of bone, using frequencies in the range 25–29 kHz, causing microvibrations of 60–210 μm. It has the ability to cut mineralized tissue without cutting neurovascular tissue and other soft tissue, thereby maintaining a blood-free operating area, better visibility and greater precision. In 2015, Cambridge University researchers working in conjunction with researchers from the National Physical Laboratory and Cambridge-based dielectric antenna company Antenova Ltd, using thin films of piezoelectric materials found that at a certain frequency, these materials become not only efficient resonators, but efficient radiators as well, meaning that they can potentially be used as antennas. The researchers found that by subjecting the piezoelectric thin films to an asymmetric excitation, the symmetry of the system is similarly broken, resulting in a corresponding symmetry breaking of the electric field, and the generation of electromagnetic radiation. In recent years, several attempts at the macro-scale application of the piezoelectric technology have emerged to harvest kinetic energy from walking pedestrians. The piezoelectric floors have been trialed since the beginning of 2007 in Tokyo Japanese train stations. The electricity generated from the foot traffic is used to measure the excitement of spectators at the Vissel Kobe football stadium. In London, a famous nightclub[which?] exploited the piezoelectric technology in its dance floor. Parts of the lighting and sound systems in the club can be powered by the energy harvesting tiles. However, the piezoelectric tile deployed on the ground usually harvests energy from low frequency strikes provided by the foot traffic. This working condition may eventually lead to low power generation efficiency. In this case, locating high traffic areas is critical for optimization of the energy harvesting efficiency, as well as the orientation of the tile pavement significantly affects the total amount of the harvested energy. A density flow evaluation is recommended to qualitatively evaluate the piezoelectric power harvesting potential of the considered area based on the number of pedestrian crossings per unit time. In X. Li's study, the potential application of a commercial piezoelectric energy harvester in a central hub building at Macquarie University in Sydney, Australia is examined and discussed. Optimization of the piezoelectric tile deployment is presented according to the frequency of pedestrian mobility and a model is developed where 3.1% of the total floor area with the highest pedestrian mobility is paved with piezoelectric tiles. The modelling results indicate that the total annual energy harvesting potential for the proposed optimized tile pavement model is estimated at 1.1 MW h/year, which would be sufficient to meet close to 0.5% of the annual energy needs of the building. In Israel, there is a company which has installed piezoelectric materials under a busy highway. The energy generated is adequate and powers street lights, billboards and signs. Tire company Goodyear has plans to develop an electricity generating tire which has piezoelectric material lined inside it. As the tire moves, it deforms and thus electricity is generated. The efficiency of a hybrid photovoltaic cell that contains piezoelectric materials can be increased simply by placing it near a source of ambient noise or vibration. The effect was demonstrated with organic cells using zinc oxide nanotubes. The electricity generated by the piezoelectric effect itself is a negligible percentage of the overall output. Sound levels as low as 75 decibels improved efficiency by up to 50%. Efficiency peaked at 10 kHz, the resonant frequency of the nanotubes. The electrical field set up by the vibrating nanotubes interacts with electrons migrating from the organic polymer layer. This process decreases the likelihood of recombination, in which electrons are energized but settle back into a hole instead of migrating to the electron-accepting ZnO layer. Energy harvesting, methods of converting other forms of energy to electricity. ^ Holler, F. James; Skoog, Douglas A. & Crouch, Stanley R. (2007). Principles of Instrumental Analysis (6th ed.). Cengage Learning. p. 9. ISBN 978-0-495-01201-6. ^ Harper, Douglas. "piezoelectric". Online Etymology Dictionary. ^ πιέζειν, ἤλεκτρον. Liddell, Henry George; Scott, Robert; A Greek–English Lexicon at the Perseus Project. ^ a b Manbachi, A. & Cobbold, R.S.C. (2011). "Development and Application of Piezoelectric Materials for Ultrasound Generation and Detection". Ultrasound. 19 (4): 187–96. doi:10.1258/ult.2011.011027. ^ Gautschi, G. (2002). Piezoelectric Sensorics: Force, Strain, Pressure, Acceleration and Acoustic Emission Sensors, Materials and Amplifiers. Springer. doi:10.1007/978-3-662-04732-3. ISBN 978-3-662-04732-3. ^ Krautkrämer, J. & Krautkrämer, H. (1990). Ultrasonic Testing of Materials. Springer. ISBN 978-3-662-10680-8. ^ Curie, Jacques; Curie, Pierre (1880). "Développement par compression de l'électricité polaire dans les cristaux hémièdres à faces inclinées" [Development, via compression, of electric polarization in hemihedral crystals with inclined faces]. Bulletin de la Société Minérologique de France. 3: 90–93. Reprinted in: Curie, Jacques; Curie, Pierre (1880). "Développement, par pression, de l'électricité polaire dans les cristaux hémièdres à faces inclinées". Comptes Rendus (in French). 91: 294–295. Archived from the original on 2012-12-05. See also: Curie, Jacques; Curie, Pierre (1880). "Sur l'électricité polaire dans les cristaux hémièdres à faces inclinées" [On electric polarization in hemihedral crystals with inclined faces]. Comptes Rendus (in French). 91: 383–386. Archived from the original on 2012-12-05. ^ Lippmann, G. (1881). "Principe de la conservation de l'électricité" [Principle of the conservation of electricity]. Annales de chimie et de physique (in French). 24: 145. Archived from the original on 2016-02-08. ^ Curie, Jacques; Curie, Pierre (1881). "Contractions et dilatations produites par des tensions dans les cristaux hémièdres à faces inclinées" [Contractions and expansions produced by voltages in hemihedral crystals with inclined faces]. Comptes Rendus (in French). 93: 1137–1140. Archived from the original on 2012-12-05. ^ Voigt, Woldemar (1910). Lehrbuch der Kristallphysik. Berlin: B. G. Teubner. Archived from the original on 2014-04-21. ^ Katzir, S. (2012). "Who knew piezoelectricity? Rutherford and Langevin on submarine detection and the invention of sonar". Notes Rec. R. Soc. 66 (2): 141–157. doi:10.1098/rsnr.2011.0049. Archived from the original on 2015-11-17. ^ a b c M. Birkholz (1995). "Crystal-field induced dipoles in heteropolar crystals – II. physical significance". Z. Phys. B. 96 (3): 333–340. Bibcode:1995ZPhyB..96..333B. doi:10.1007/BF01313055. Archived from the original on 2016-10-30. ^ S. Trolier-McKinstry (2008). "Chapter3: Crystal Chemistry of Piezoelectric Materials". In A. Safari; E.K. Akdo˘gan (eds.). Piezoelectric and Acoustic Materials for Transducer Applications. New York: Springer. ISBN 978-0-387-76538-9. ^ Sensor Sense: Piezoelectric Force Sensors Archived 2010-04-13 at the Wayback Machine. Machinedesign.com (2008-02-07). Retrieved on 2012-05-04. ^ a b Damjanovic, Dragan (1998). "Ferroelectric, dielectric and piezoelectric properties of ferroelectric thin films and ceramics". Reports on Progress in Physics. 61 (9): 1267–1324. Bibcode:1998RPPh...61.1267D. doi:10.1088/0034-4885/61/9/002. ^ Kochervinskii, V. (2003). "Piezoelectricity in Crystallizing Ferroelectric Polymers". Crystallography Reports. 48 (4): 649–675. Bibcode:2003CryRp..48..649K. doi:10.1134/1.1595194. ^ "Piezoelectric Crystal Classes". Newcastle University, UK. Archived from the original on 2 April 2015. Retrieved 8 March 2015. ^ "Pyroelectric Crystal Classes". Newcastle University, UK. Archived from the original on 2 April 2015. Retrieved 8 March 2015. ^ Radusinović, Dušan & Markov, Cvetko (1971). "Macedonite – lead titanate: a new mineral" (PDF). American Mineralogist. 56: 387–394. Archived (PDF) from the original on 2016-03-05. ^ Burke, E. A. J. & Kieft, C. (1971). "Second occurrence of makedonite, PbTiO3, Långban, Sweden". Lithos. 4 (2): 101–104. Bibcode:1971Litho...4..101B. doi:10.1016/0024-4937(71)90102-2. ^ Akizuki, Mizuhiko; Hampar, Martin S.; Zussman, Jack (1979). "An explanation of anomalous optical properties of topaz" (PDF). Mineralogical Magazine. 43 (326): 237–241. Bibcode:1979MinM...43..237A. CiteSeerX 10.1.1.604.6025. doi:10.1180/minmag.1979.043.326.05. ^ Minary-Jolandan, M. & Yu, Min-Feng (2009). "Nanoscale characterization of isolated individual type I collagen fibrils: Polarization and piezoelectricity". Nanotechnology. 20 (8): 085706. Bibcode:2009Nanot..20h5706M. doi:10.1088/0957-4484/20/8/085706. PMID 19417467. ^ Lakes, Roderic. "Electrical Properties of Bone: A Review". University of Wisconsin–Madison. Archived from the original on 2013-11-05. ^ Becker, Robert O.; Marino, Andrew A. (1982). "Chapter 4: Electrical Properties of Biological Tissue (Piezoelectricity)". Electromagnetism & Life. Albany, New York: State University of New York Press. ISBN 978-0-87395-560-7. Archived from the original on |archive-url= requires |archive-date= (help). ^ Pollack, S. R.; Korostoff, E.; Starkebaum, W.; Lannicone, W. (1979). "Micro-Electrical Studies of Stress-Generated Potentials in Bone". In Brighton, C. T.; Black, J.; Pollack, S. R. (eds.). Electrical Properties of Bone and Cartilage. New York, NY: Grune & Stratton. ISBN 978-0-8089-1228-6. ^ Fotiadis, D. I.; Foutsitzi, G.; Massalas, C. V. (1999). "Wave propagation modeling in human long bones". Acta Mechanica. 137 (1–2): 65–81. doi:10.1007/BF01313145. ^ Lee, B. Y.; Zhang, J.; Zueger, C.; Chung, W. J.; Yoo, S. Y.; Wang, E.; Meyer, J.; Ramesh, R.; Lee, S. W. (2012-05-13). "Virus-based piezoelectric energy generation". Nature Nanotechnology. 7 (6): 351–6. Bibcode:2012NatNa...7..351L. doi:10.1038/nnano.2012.69. PMID 22581406. ^ Ganeshkumar, Rajasekaran; Somnath, Suhas; Cheah, Chin Wei; Jesse, Stephen; Kalinin, Sergei V.; Zhao, Rong (2017-12-06). "Decoding Apparent Ferroelectricity in Perovskite Nanofibers". ACS Applied Materials & Interfaces. 9 (48): 42131–42138. doi:10.1021/acsami.7b14257. ISSN 1944-8244. ^ Saito, Yasuyoshi; Takao, Hisaaki; Tanil, Toshihiko; Nonoyama, Tatsuhiko; Takatori, Kazumasa; Homma, Takahiko; Nagaya, Toshiatsu; Nakamura, Masaya (2004-11-04). "Lead-free piezoceramics". Nature. 432 (7013): 81–87. Bibcode:2004Natur.432...84S. doi:10.1038/nature03028. PMID 15516921. Archived from the original on 2008-12-26. ^ Gurdal, Erkan A.; Ural, Seyit O.; Park, Hwi-Yeol; Nahm, Sahn; Uchino, Kenji (2011). "High Power (Na0.5K0.5)NbO3-Based Lead-Free Piezoelectric Transformer". Japanese Journal of Applied Physics. 50 (2): 027101. Bibcode:2011JaJAP..50b7101G. doi:10.1143/JJAP.50.027101. ISSN 0021-4922. ^ Migliorato, Max; et al. (2014). "A Review of Non Linear Piezoelectricity in Semiconductors". AIP Conf Proc. AIP Conference Proceedings. 1590 (N/A): 32–41. doi:10.1063/1.4870192. ^ a b c d Sappati, Kiran; Bhadra, Sharmistha; Sappati, Kiran Kumar; Bhadra, Sharmistha (2018). "Piezoelectric Polymer and Paper Substrates: A Review". Sensors. 18 (11): 3605. doi:10.3390/s18113605. PMC 6263872. PMID 30355961. ^ Ma, Si Wei; Fan, You Jun; Li, Hua Yang; Su, Li; Wang, Zhong Lin; Zhu, Guang (2018-09-07). "Flexible Porous Polydimethylsiloxane/Lead Zirconate Titanate-Based Nanogenerator Enabled by the Dual Effect of Ferroelectricity and Piezoelectricity". ACS Applied Materials & Interfaces. 10 (39): 33105–33111. doi:10.1021/acsami.8b06696. ISSN 1944-8244. PMID 30191707. ^ Chen, Xiaoliang; Parida, Kaushik; Wang, Jiangxin; Xiong, Jiaqing; Lin, Meng-Fang; Shao, Jinyou; Lee, Pooi See (2017-11-20). "A Stretchable and Transparent Nanocomposite Nanogenerator for Self-Powered Physiological Monitoring". ACS Applied Materials & Interfaces. 9 (48): 42200–42209. doi:10.1021/acsami.7b13767. ISSN 1944-8244. PMID 29111642. ^ Moody, M. J.; Marvin, C. W.; Hutchison, G. R. (2016). "Molecularly-doped polyurethane foams with massive piezoelectric response". Journal of Materials Chemistry C. 4 (20): 4387–4392. doi:10.1039/c6tc00613b. ISSN 2050-7526. ^ Kholkin, Andrei; Nadav, Amdursky; Igor, Bdikin; Ehud, Gazit; Gil, Rosenman (2010). "Strong Piezoelectricity in Bioinspired Peptide Nanotubes". ACS Nano. 4 (2): 610–614. doi:10.1021/nn901327v. PMID 20131852. ^ "Market Report: World Piezoelectric Device Market". Market Intelligence. Archived from the original on 2011-07-03. ^ Richard, Michael Graham (2006-08-04). "Japan: Producing Electricity from Train Station Ticket Gates". TreeHugger. Discovery Communications, LLC. Archived from the original on 2007-07-09. ^ Wright, Sarah H. (2007-07-25). "MIT duo sees people-powered "Crowd Farm"". MIT news. Massachusetts Institute of Technology. Archived from the original on 2007-09-12. ^ Kannampilly, Ammu (2008-07-11). "How to Save the World One Dance at a Time". ABC News. Archived from the original on 2010-10-31. ^ Barbehenn, George H. (October 2010). "True Grid Independence: Robust Energy Harvesting System for Wireless Sensors Uses Piezoelectric Energy Harvesting Power Supply and Li-Poly Batteries with Shunt Charger". Journal of Analog Innovation: 36. ^ Phillips, James R. (2000-08-10). "Piezoelectric Technology: A Primer". eeProductCenter. TechInsights. Archived from the original on 2010-10-06. ^ Speck, Shane (2004-03-11). "How Rocket-Propelled Grenades Work by Shane Speck". HowStuffWorks.com. Archived from the original on 2012-04-29. Retrieved 2012-05-04. ^ Moubarak, P.; et al. (2012). "A Self-Calibrating Mathematical Model for the Direct Piezoelectric Effect of a New MEMS Tilt Sensor". IEEE Sensors Journal. 12 (5): 1033–1042. Bibcode:2012ISenJ..12.1033M. doi:10.1109/jsen.2011.2173188. ^ Le Letty, R.; Barillot, F.; Lhermet, N.; Claeyssen, F.; Yorck, M.; Gavira Izquierdo, J.; Arends, H.; Barillot, F.; Lhermet, N.; Claeyssen, F.; Yorck, M.; Gavira Izquierdo, J.; Arends, H. (2001). "The scanning mechanism for ROSETTA/MIDAS from an engineering model to the flight model". In Harris, R. A. (ed.). Proceedings of the 9th European Space Mechanisms and Tribology Symposium, 19–21 September 2001, Liège, Belgium. 9Th European Space Mechanisms and Tribology Symposium. ESA SP-480. 480. pp. 75–81. Bibcode:2001ESASP.480...75L. ISBN 978-92-9092-761-7. ^ Simonsen, Torben R. (27 September 2010). "Piezo in space". Electronics Business (in Danish). Archived from the original on 29 September 2010. Retrieved 28 September 2010. ^ "Isn't it amazing how one smart idea, one chip and an intelligent material has changed the world of tennis?". HEAD. Archived from the original on February 22, 2007. Retrieved 2008-02-27. ^ Baltaci, Volkan; Ayvaz, Özge Üner; Ünsal, Evrim; Aktaş, Yasemin; Baltacı, Aysun; Turhan, Feriba; Özcan, Sarp; Sönmezer, Murat (2009). "The effectiveness of intracytoplasmic sperm injection combined with piezoelectric stimulation in infertile couples with total fertilization failure". Fertil. Steril. 94 (3): 900–4. doi:10.1016/j.fertnstert.2009.03.107. PMID 19464000. ^ Hoigne, D.J. ; Stubinger, S.; von Kaenel, O.; Shamdasani, S.; Hasenboehler, P. (2006). "Piezoelectric osteotomy in hand surgery: first experiences with a new technique". BMC Musculoskelet. Disord. 7: 36. doi:10.1186/1471-2474-7-36. PMC 1459157. PMID 16611362. ^ Labanca, M.; Azzola, F.; Vinci, R.; Rodella, L. F. (2008). "Piezoelectric surgery: twenty years of use". Br. J. Oral Maxillofac. Surg. 46 (4): 265–9. doi:10.1016/j.bjoms.2007.12.007. PMID 18342999. ^ Sinha, Dhiraj; Amaratunga, Gehan (2015). "Electromagnetic Radiation Under Explicit symmetry Breaking". Physical Review Letters. 114 (14): 147701. Bibcode:2015PhRvL.114n7701S. doi:10.1103/physrevlett.114.147701. PMID 25910163. ^ "New understanding of electromagnetism could enable 'antennas on a chip'". cam.ac.uk. 2015-04-09. Archived from the original on 2016-03-04. ^ Takefuji, Y. (April 2008). "And if public transport does not consume more of energy?" (PDF). Le Rail: 31–33. ^ Takefuji, Y. (September 2008). Known and unknown phenomena of nonlinear behaviors in the power harvesting mat and the transverse wave speaker (PDF). international symposium on nonlinear theory and its applications. ^ Arjun, A.; Sampath, A.; Thiyagarajan, S.; Arvind, V. (December 2011). "A Novel Approach to Recycle Energy Using Piezoelectric Crystals". International Journal of Environmental Science and Development. 2: 488–492. doi:10.7763/IJESD.2011.V2.175. ^ a b c Li, Xiaofeng; Strezov, Vladimir (2014). "Modelling piezoelectric energy harvesting potential in an educational building". Energy Conversion and Management. 85: 435–442. doi:10.1016/j.enconman.2014.05.096. ^ "Goodyear Is Trying to Make an Electricity-Generating Tire". WIRED. 2015-03-12. Archived from the original on 11 May 2016. Retrieved 14 June 2016. ^ Heidi Hoopes (November 8, 2013). "Good vibrations lead to efficient excitations in hybrid solar cells". Gizmag.com. Archived from the original on November 11, 2013. Retrieved 2013-11-11. ^ Shoaee, S.; Briscoe, J.; Durrant, J. R.; Dunn, S. (2013). "Acoustic Enhancement of Polymer/ZnO Nanorod Photovoltaic Device Performance". Advanced Materials. 26 (2): 263–8. doi:10.1002/adma.201303304. PMID 24194369. Wikimedia Commons has media related to Piezoelectricity. Gautschi, Gustav H. (2002). Piezoelectric Sensorics. Springer. ISBN 978-3-540-42259-4.